Oh, hey! Guess what! Today is October 25. You know what that means?! CHRISTMAS IS IN TWO MONTHS! How exciting is that? For me, pretty exciting because I love Christmas, but with that holiday comes a boat load of stress. 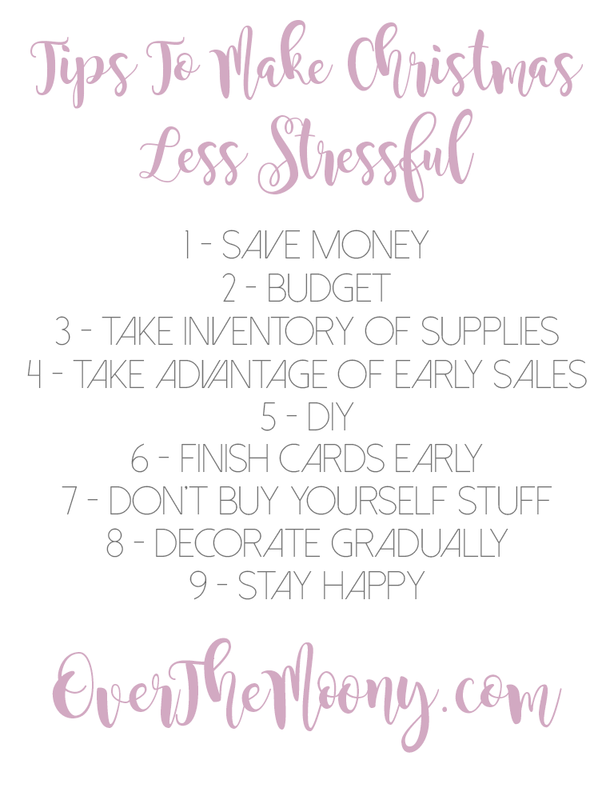 So, today, with two months to go, let's talk about how to make the holiday much less stressful and much more enjoyable! You have two months to go (did I mention that already? ), so theoretically that means you have about four paychecks left to put some money aside if you haven't already. I would highly recommend just trying to put aside whatever you can because that makes life so much easier. Nothing makes Christmas more overwhelming than all of the money you're going to be spending, especially when it sneaks up on you and you realize you don't have enough money to outright buy everything so lots of money goes on your credit card. I think we've all been there. But if you're able to put something aside, it'll make it a little less stressful. In fact, if you don't do this already, I would suggest doing this at the beginning of the year as well. I've been putting money into my savings account that is strictly related to Christmas so I don't have to freak out too much when the season sneaks up on me. Again, this is a very personal thing since we all have different lives and financial situations, but even if you're able to put aside $25 a pay check that will give you $550 come December to have for your Christmas shopping. It's always good to plan ahead! I know that I always run into the problem of wanting to buy people so much stuff once I get started on buying them things, but it's best to make a budget for each person and stick to it. If it helps, get all of the cash you're able to spend on Christmas and actually make up an envelope for each person to put their budgeted amount in. If you have to order something online, make sure to deposit that money into your bank account so you aren't tempted to use that money on someone or something else. Also, set aside days for each person you're shopping for and just take that person's budgeted amount out with you. This way you're not tempted to dip into someone else's money so that another person can get something extra. Another rule that I like to keep to, especially since I buy so much stuff online nowadays, is not allowing any shipping costs to factor into their budget. It isn't their fault that I'm paying shipping so I don't mind eating the cost. I'll also try to lump together a couple gifts to try to get free shipping if possible. I can't even tell you how many times I go out and buy rolls upon rolls of wrapping paper, only to come home and discover that I have more than enough unopened rolls of wrapping paper in my closet. Before you go out and get sucked into all of the pretty gift tags and ribbons, take a look around your house to see what you have. Odds are, you probably never used up what you had from years past and you won't need to buy anymore. I'm just as much of a sucker for making the wrapping look beautiful, but if it can save you a couple dollars to use some paper that you thought was pretty last year, I think it's worth it in the long run. I have been getting flooded with e-mails from various stores that are already having some crazy good sales. Take advantage of them! Not only will you get some great deals, but you'll probably have a better selection since most people wait until the last minute to go shopping. Also, if you aren't already a member of a cash back website like Ebates, go join! It's free and you essentially are getting paid to go shopping. There are so many stores affiliated with this website and they all have cash back percentages when you go to their website through Ebates. If you're a new member, you even get a $10 gift card to WalMart or a $10 cash back bonus. There are certain times when the percentages get up to 15% so keep an eye out on that. Saving money is always good because then you can get more gifts for your budgeted amount! There are so many cute DIY gifts that you can find on YouTube and Pinterest that don't cost a lot of money, or that you can get a lot of uses out of the supplies you have to buy. For instance, in my office there is a group of us that always exchange gifts. Some of the people I'm incredibly close with so it is very easy for me to buy them gifts, but there are a couple people that I know, but I don't know well enough to buy them really personal gifts geared towards their interests. This year, I'm thinking I'm going to make up a batch of body scrubs or a cute hot cocoa set or a candle (edit: it turned out to be a candle, and I made a post about it which you can view here, and you can also see the full gift set I made for them here)to give to the people that I can never pinpoint a great gift for. I think those kinds of gifts are great for co-workers or family of a new boyfriend/girlfriend that you don't know very well. You can't go wrong with something crafty! Plus there's so many cute printables you can find online to really make them look extra fancy. I'm not someone who sends out Christmas cards but I know there are a lot of people who still do. Why not get started on them now? Once Halloween is done, Christmas is going to be here before you know it. Couple that with all of the Thanksgiving and Holiday parties, plus the shopping and running around for the odds and ends you need and you're not going to have a free moment. While you're catching up on your TV shows, take out some Christmas cards and get started! That way, once it's December, all you'll need to do is slap some festive stamps on those suckers and put them in the mailbox. It's always nice to have one less thing to worry about! Odds are, you are going to be asked a million times what you want for Christmas by your family, your friends and maybe even your co-workers. If you're anything like me, your answer will probably be "I don't know". It makes answering that question a whole lot easier if you stop buying yourself the things you want and start keeping a list of those things instead! As much as it takes the fun out of being surprised with a gift, it gives people a direction to go in, which I promise they will be greatful for. Also, I know all of the Christmas decorations are adorable and I have been sucked into buying many of them, but unless you're out on your own for the first time and don't have many decorations, I promise you you don't need the $50 reindeer statue. Put it down. It's adorable, but that $50 can be better spent somewhere else, I promise. It's so easy to get sucked into all of the Christmas decorations (I'm looking at you, Target), but you'll be happier in the end to have used that money as the budget on one person you need to buy presents for instead of having an additional decoration in your home. Decorating for the holidays can be super daunting, especially if you're in a house. I'm in an apartment and I've taken to a more gradual approach of decorating over the past couple years that has worked quite well. I can't help but feel in a Christmas mood after Halloween is over. It's not that I want to rush Fall and Thanksgiving, but it just makes me so excited! I start working small wintery accents into my decor so that once Thanksgiving is over, it's just a matter of switching out some small decorations to make it feel more like Christmas. I feel like decorating can take up an entire weekend and those weekends start to get pretty packed. This way you can turn it into an afternoon project on a Saturday rather than dedicating an entire weekend to it. I know, easier said than done, but Christmas really is such a magical time. Don't allow it to get to you and make you crazy. Enjoy every aspect of it. You get to see all of your loved ones, you get to make them happy, so keep that feeling yourself! For me, I find I stay happiest when I get everything done early so I don't have to deal with the crowds in the stores, but maybe that's something that you enjoy. Find the aspect of the season that gives you a smile and stick with it! Think about the things that stress you out and do what you can to avoid them. If being proactive isn't your thing, maybe try to take a day off from work in December during the week instead of having to brave the stores on the weekend. Is it still going to be crowded? Probably, but at least it won't be as bad. Just grab yourself a delicious warm beverage, get your game face on and trudge through the part that's going to drive you crazy so you can just sit back, relax, and enjoy. So those are my tips for a less stressful holiday season. 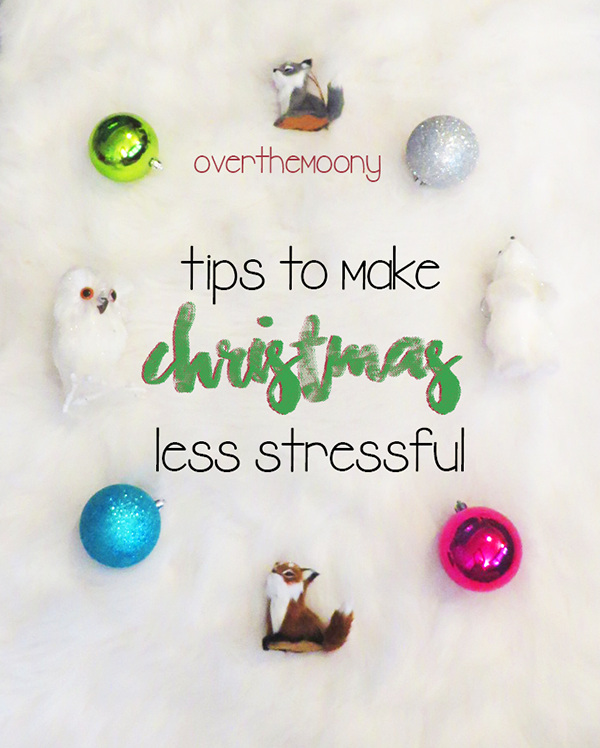 Do you have any strategies to make Christmas less stressful for you? Let me know in the comments below! I think we can all use all the help we can get!